Home to Lake Huron, Lake Erie, Lake St. Clair and the Grand River, you&apos;re never far from the water&apos;s edge in Ontario&apos;s Southwest. Our clean water, soft sandy shorelines and friendly communities make us the natural choice when it’s time to hit the beach. The toughest part can be choosing between so many amazing beaches. What interesting excursions are nearby? How can you save on local lodging and dining? When are the best local festivals and events? Everything we learned has been consolidated into easy-to-follow tip sheets that will allow you to click your way to your best beach vacation yet. Start planning now! Looking for a Lake Erie beach vacation? Choose from the best-bet beaches below. Rock Point Provincial Park has a lovely one-kilometre sand and pebble beach. Budding paleontologists will love searching for exposed fossils in the ancient coral reef that’s embedded in a limestone shelf along the beach. Find everything you need to plan a Rock Point beach vacation. Turkey Point Provincial Park has two kilometres of soft, sandy beach and is a great choice for young children. Find out everything you need to plan a Turkey Point beach vacation. Long Point Provincial Park is home to a 40-kilometre-long sandspit that is so unique it’s been recognized as a UNESCO World Biosphere Reserve. Find out everything you need to know to plan a Long Point beach vacation. Port Burwell Provincial Park has 2.5 kilometres of clean, sandy beach as well as hiking trails, a Cold War-era submarine, a marine museum and a beautiful lighthouse. Find out everything you need to know to plan a Port Burwell beach vacation. 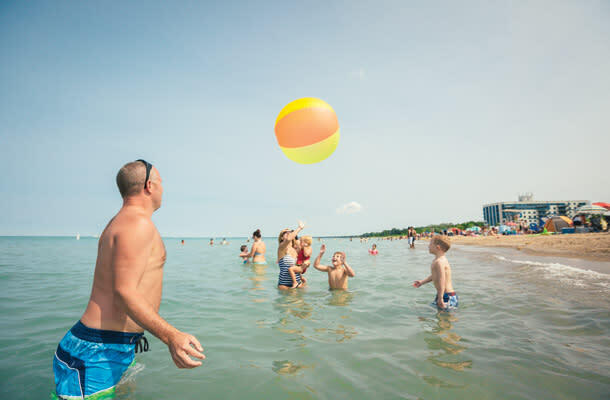 Port Stanley’s Main Beach has one of the finest stretches of sandy beach on Lake Erie’s north shore and is one of only 27 beaches in Canada to have earned Blue Flag status for its commitment to strict water quality and safety standards. Find out everything you need to know to plan a Port Stanley beach vacation. Port Glasgow’s small, sandy beach is a great choice if you’re looking for a beautiful destination without a lot of hustle and bustle. 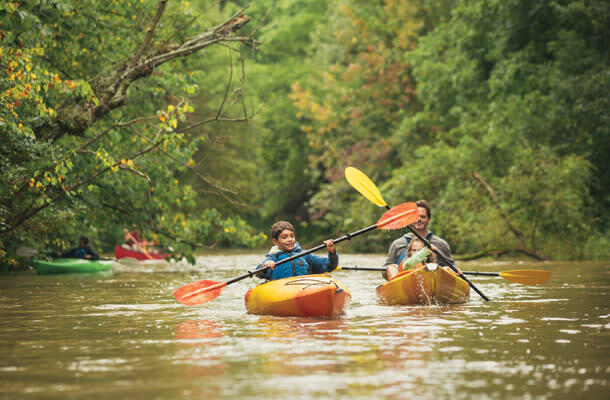 It’s just recently earned a Blue Flag designation for its commitment to strict water quality and safety standards. Find out everything you need to know to plan a Port Glasgow beach vacation. Rondeau Provincial Park has 11 kilometres of sandy beaches and excellent hiking, fishing, boating and birding. Find out everything you need to know to plan a Rondeau beach vacation. Erieau is a cool little village that boasts some of the warmest waters on Lake Erie and great fishing. 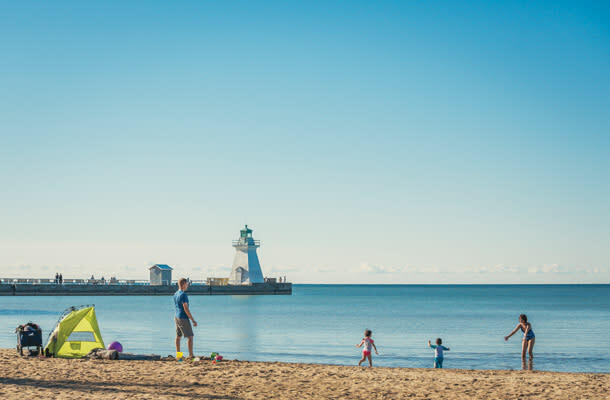 Find out everything you need to know to plan an Erieau beach vacation. Point Pelee National Park has 20 kilometres of smooth sand that stretches out into the lake on a long peninsula. 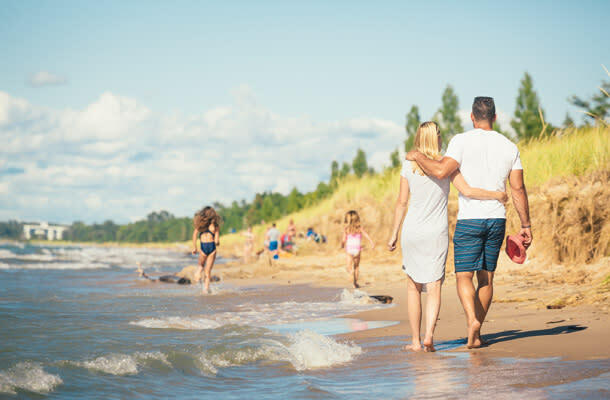 Find out everything you need to know to plan a Point Pelee beach vacation. 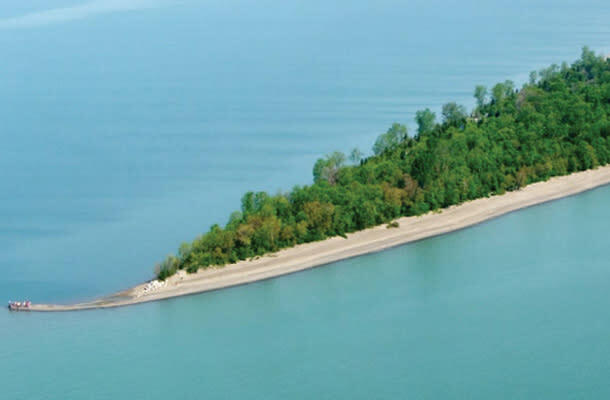 Fish Point Provincial Nature Reserve sits on the southwestern tip of Pelee Island, making it the southernmost beach in the entire country! Find out everything you need to know to plan a Pelee Island beach vacation. 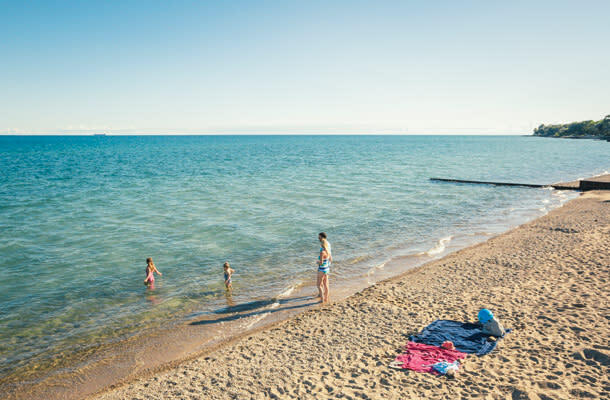 Canatara Park Beach is an urban beach in the heart of Sarnia that has plenty of kid-friendly activities and is close to any conveniences you might require. It’s also one of only 27 in Canada to have earned official Blue Flag status for its commitment to strict water quality and safety criteria. Find out everything you need to know to plan a Canatara beach vacation. 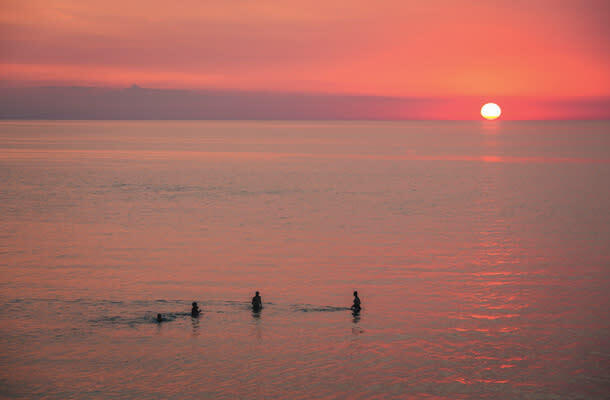 Pinery Provincial Park boasts 10 kilometres of sandy beach and National Geographic has described the area as having the “Top Ten Best Sunsets” in the world. Find out everything you need to know to plan a Pinery beach vacation. 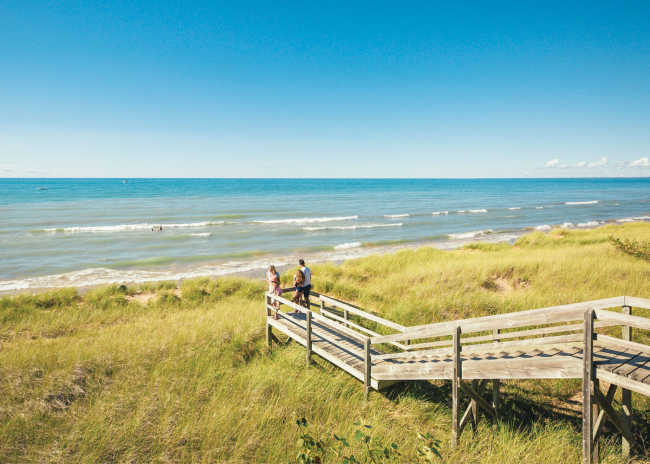 Grand Bend has earned a reputation as one of Canada’s best beach towns. It’s also been designated a Blue Flag beach (one of only 27 in Canada) for its commitment to strict water quality and safety standards. Find out everything you need to know to plan a Grand Bend beach vacation.